HF: I learnt about this company through the personal effects of Harry Kin Hong Long who briefly worked for Kung Lee from March to July 1923. 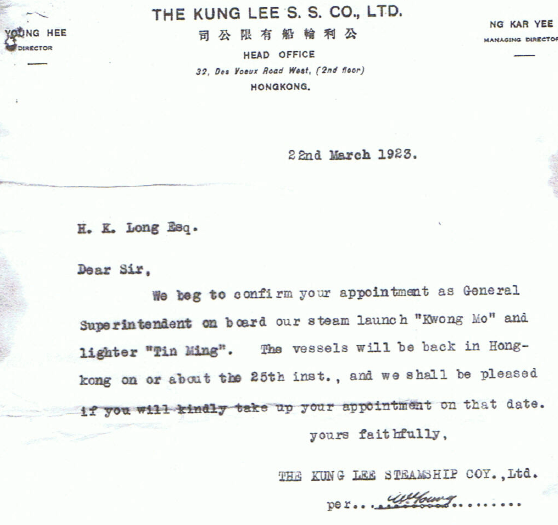 Harry worked on two ships, the Kwong Mo and the Tin Ming as can be seen in his appointment letter below. Stephen Davies provides some background detail: The Kung Lee SS Co was very short-lived. The company was founded on 23 February 1922 and was dissolved four and a half years later on 22 October 1926. The interesting thing is that it was founded bang in the middle of the great 1922 Seamen’s Strike, when almost all shipping was paralysed…and it was dissolved pretty much as the general strike of 1926 was coming to an end, which also had a pretty flattening effect on shipping traffic. Maybe connected, maybe not – the main target tended to be British shipping lines and if anyone was getting into strike breaking and making money, it would have been small Chinese shipping lines. This was also the period when there were major ructions up the West River, where there was a lot of fighting as warlordism got on a roll and where contemporary reports of banditry were most prevalent. And 1922 was also the period of the attempted insurrection in Guangzhou. There were a lot of small Chinese owned river steamer companies that owned one steamer or maybe two. Only a few ever lasted very long and most were operating second-hand and small vessels, picking up the minor traffic that the major lines weren’t bothered with. I can’t find any trace in the English language newspapers and in general the shipping pages did not carry any regular timetabling or consignment details for the river steamer trade. Stephen Davies adds: Clearly Kung Lee (公利輪船有限公司 (the letterhead is traditional right to left) were operating in the relatively slow river freight business with small steam vessels (steam launches) that they used for towing lighters, which would have been what carried the cargo. They’re the ancestors of the modern river trade cargo boats and a lot of HK to Guangdong hinterland traffic was shifted this way, since the cargo could go straight from ship working midstream into the lighter and then be towed to its destination wherever that was in the Pearl River delta area – or the lighter could be loaded from a godown on the waterfront (probably most common) and then towed wherever. The towboat didn’t have to wait for the lighter to unload but could just return with either an empty lighter (not usual) or one already loaded for the backhaul. Many thanks to Harry Long’s daughter Judy Chan who kindly sent a considerable amount of biographical detail about him to our Group.